The other day we were in a little grocery store here in New Zealand, looking for some quick supplies to make lunch in our campervan. Michael scanned their modest cheese section hoping to find something beyond the standard Cheddar and Edam options, to add a bit of interest to our sandwiches. He found Gruyere, an Adamo family favourite, but missed the small print. What he actually bought was ‘Gruyere-Style’ cheese—and a very bland rendition at that, with not much more than a name in common with the original. I’m pretty sure the Swiss would not approve. Michael and I had a good laugh. We know better than to trust anything bearing the ‘-style’ suffix. ‘Italian-style’, ‘Greek-style’, ‘Gruyere-style…run a mile. But now I find myself wanting to share a recipe we have created based on the Italian classic, Tonno & Faggioli. It would be wrong to label our version Italian, but I couldn’t possibly add style to the title of this post. Here’s our version of a dish that we love to eat in Italy. We have no clue if this is how the Italians make it, but it’s certainly been influenced by their recipe. So we’re going with Italian-inspired. Ha! Drain the cans of beans and tuna and empty into a bowl. 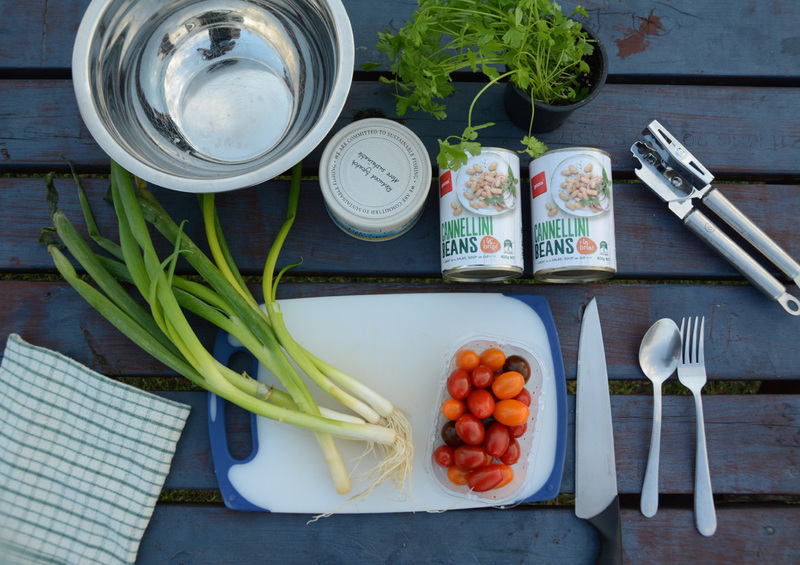 Chop tomatoes and spring onions and add to the bean and tuna mix. 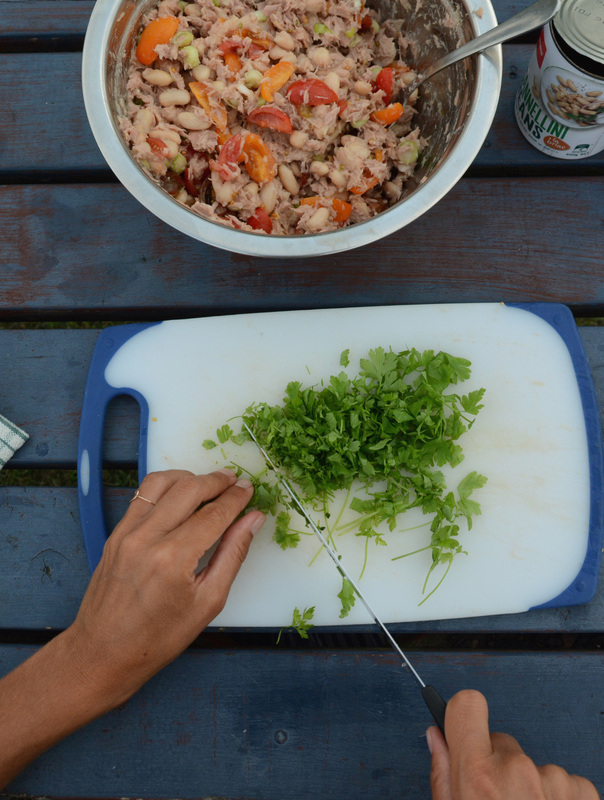 Chop the flat-leaf parsley and sprinkle into the bowl. Drizzle with olive oil and a splash of balsamic vinegar. Add salt and pepper to taste. 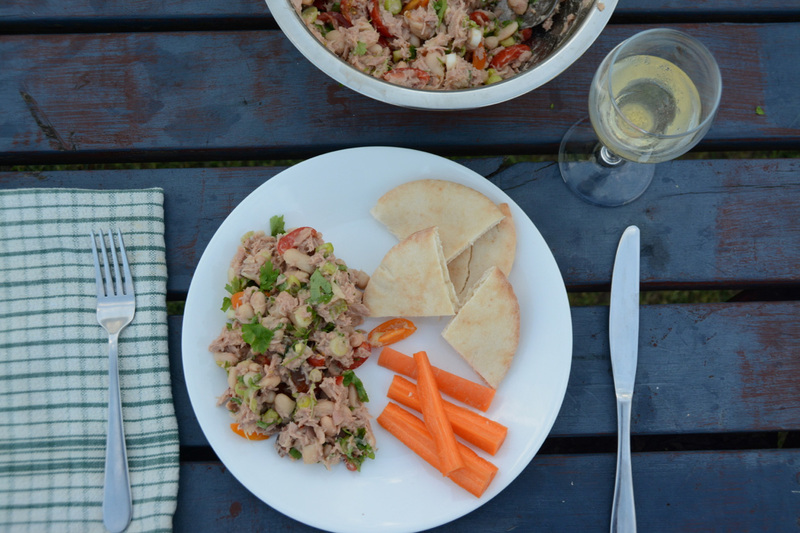 We usually serve with some good Italian ciabatta bread, but we had a difficult time finding that when it came time to snap some photos of our meal – so pita bread it was. Not very Italian, but this is camping-style fare! p.s. 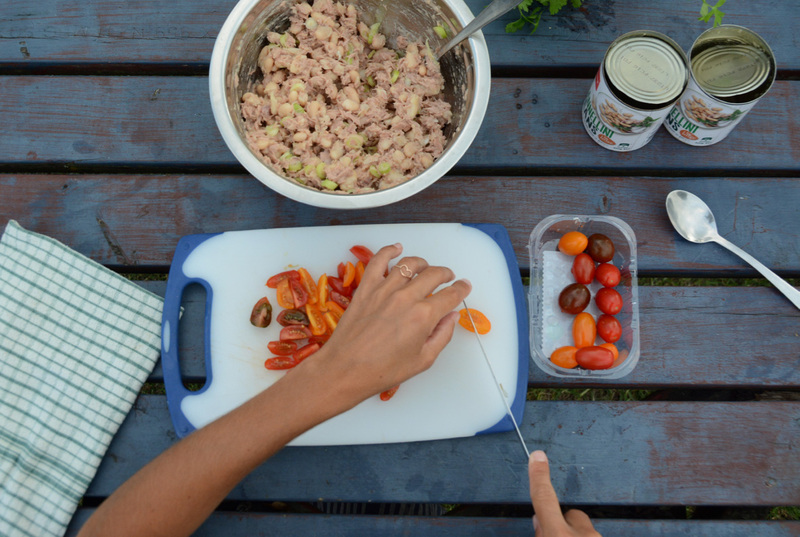 This simple tomato pasta and this tuna pasta are other favourite camping meals. So easy! We are trying this tomorrow! we do the “spanish inspired” version here at home, just replace the beans for chickpeas. we all love it. My family is Italian and we too, now replace the tuna for another type of bean (or chickpeas, as above). Much kinder on the environment – especially when we have so many mouths to feed!